The politician, Mukesh Kumar Lodi, claimed in his complaint to the police that he and his associates were shot at and assaulted by AMU students outside the campus main gate because their motorcycles sported BJP stickers. Students have denied the charge. Students say Republic TV wanted to shoot inside the AMU campus without requisite permissions. 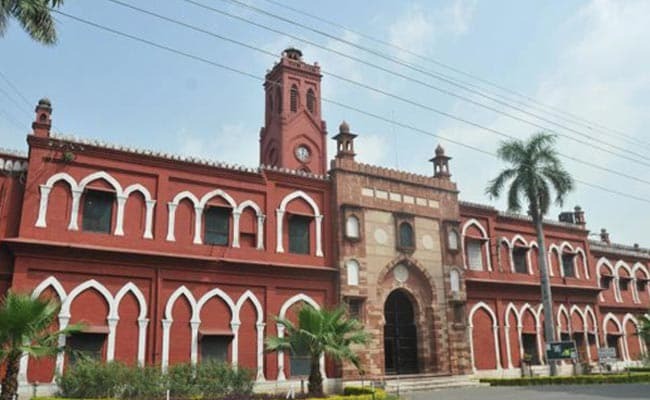 The Uttar Pradesh police today charged 14 students of the Aligarh Muslim University (AMU) with sedition after a local BJP leader alleged in a police complaint that they had indulged in violence and shouted anti-India slogans outside the main gate of the institution the previous day. Eight of these students have been suspended by the university pending inquiry. The politician, Mukesh Kumar Lodi, claimed in his complaint to the police that he and his associates were shot at and assaulted by AMU students outside the campus main gate because their motorcycles sported BJP stickers. He also accused the students of shouting slogans favouring Pakistan over India in the course of the violence. University students had entered into a heated argument with the crew of Republic TV - a private television channel - after the latter tried to shoot a segment inside the campus allegedly in violation of institution regulations on Tuesday. AMU students have accused the mediapersons of trying to shoot inside the campus without obtaining requisite permissions, and misbehaving with campus security personnel and university officials upon being advised against doing so. Former Jammu and Kashmir Chief Minister Mehbooba Mufti weighed in on the matter soon after, criticising the manner in which the controversial anti-sedition law was being freely implemented under the BJP rule. "Slapping sedition laws against AMU students for arguing with the Republic TV crew is ridiculous. The law can be invoked only when any individual tries to excite dissatisfaction towards the centre. Since when did R-TV start representing the government?" she asked. Tensions rose after the students were booked under the sedition law, and news agency PTI reported that internet services will be suspended in the city as a precautionary measure. Rapid Action Force personnel were deployed around the campus amid protests, and a motorcycle belonging to an ABVP member was set afire, the news agency quoted a senior police officer as saying. The main approach road to the university campus at IG Khan crossing has also been closed to prevent any untoward incident, it added.